About 15 years ago, after patients had cleared Syphillis, other mysterious symptoms started being consistently illuminated. Backache, lymph-node swelling, kidney affectations and flu-like symptoms were coming up in small group of patients. It was Dr. Sankaran, I believe, who’d written that after Syph. is addressed, look for symptoms of Lyme. The Genetic Miasms are not directly stemming from direct sexual transmission or even a bite from a tick anymore, however, as a function of human evolution, the disease is showing up in our inner milieux as just one more hoop to be jumped before we can know our human freedom. It’s a physical and mental shape shifter as Jeff wrote about here. He actually experienced it’s surprising effects 3 years ago and wrote about his mental sufferings with this disease matrix himself here. We’ve even cured dogs of it where it was clearly showing up after a tick bite in their kidneys. We treat it the same as we do any other Miasmic Disease, on the sound basis of law, like cures like as illustrated here. Stage 1 . 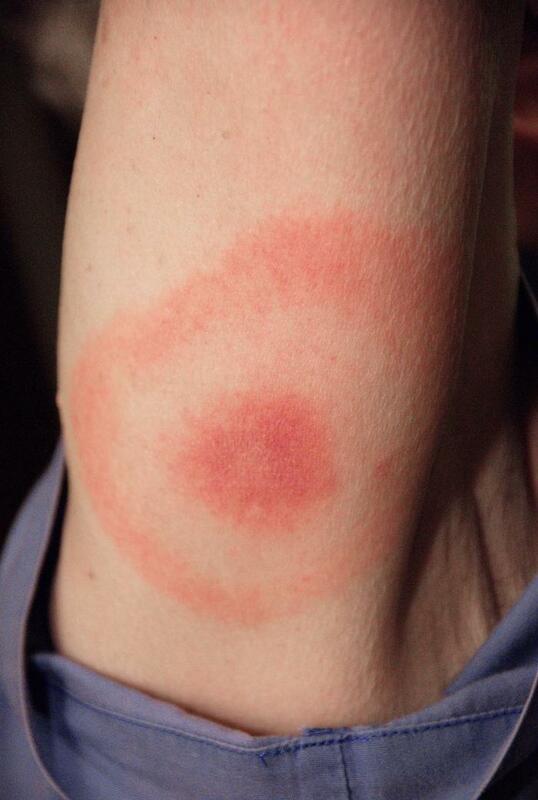 In the majority of cases, the first sign of early Lyme disease is the appearance of a bull’s-eye skin rash. It usually develops about 1 – 2 weeks after the bite, although it may appear as soon as 3 days, and as late as 1 month. In some cases, it is never detected. 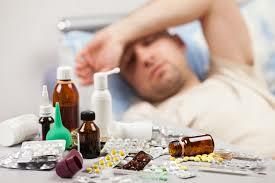 Flu-like symptoms (joint aches, fever, and general fatigue) commonly develop. Stage 2 . Untreated, the infection spreads through the bloodstream and lymph nodes within days to weeks, involving the joints, nervous system, and possibly the heart. Multiple rashes may erupt in other places. If the infection affects the nervous system in stage 2, it most often causes weakness or paralysis in the nerves of the face (Bell’s palsy) or in nerves of the spine. Stage 3 . If the disease remains untreated, a persistent infection can occur after a few weeks or months, leading to prolonged bouts of arthritis and neurologic problems, such as concentration problems or personality changes. Fatigue is a prominent feature of both early and late stages. 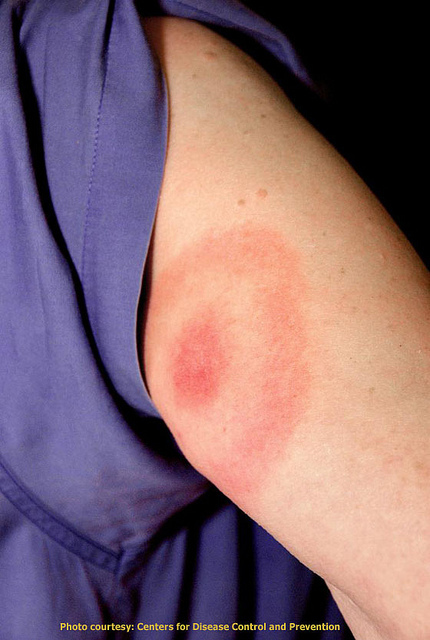 The bull’s-eye skin rash, known as erythema migrans (ECM), usually first appears on the thigh, buttock, or trunk in older children and adults, and on the head or neck in young children. It can first appear as a pimple-like spot, which expands over the next few days into a purplish circle. The circle may reach up to 6 inches in diameter with a deeper red rim. In some cases the ring is incomplete, forming an arc rather than a full circle. The center of the rash often clears or may turn bluish. Or secondary concentric rings may develop within the original ring, creating the bull’s-eye pattern. Over the next several weeks, the circular rash may grow to as large as 20 inches across. Patients often describe the sensation of the rash as burning rather than itching. Up to 20% of people infected with Lyme disease do not exhibit the rash. On dark-skinned people, the rash may resemble a bruise. In most patients, any rash fades completely after 3 – 4 weeks, although secondary rashes may appear during the later stages of disease. Common Neurologic Symptoms. Neurologic symptoms can first appear while the initial skin rash is still present or within 6 weeks after its disappearance. Sometimes they are the first symptoms that the patient experiences, but sometimes they may not occur until many months after the tick bite. The most common neurologic symptoms include headaches, sleep problems, and mood disturbance. Memory problems can also occur, as well as nerve damage in arms and legs. Neurologic symptoms typically improve or resolve within a few weeks or months, even in untreated patients. Bell’s Palsy. In some patients, the facial nerve is affected, which results in Bell’s palsy. This is a sudden weakness and drooping of the facial muscles and eyelid on one side of the face. Nerves around the facial area may also cause numbness, dizziness, double vision, and hearing changes. Heart symptoms, such as an irregular heartbeat, may develop several weeks after infection, but this is not very common. In rare cases, Lyme disease may cause eye inflammation (conjunctivitis). This is why the Heilkunst approach is so effective: all aspects of the whole being and their environment are considered in their treatment. 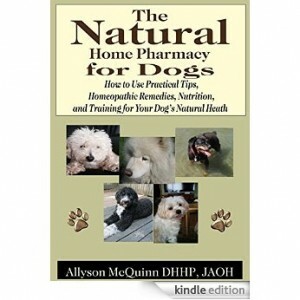 “A very important aspect of this book is the discussion on how our own mental and physical state affects our pet’s health. 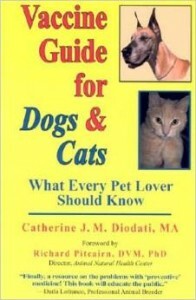 We have all witnessed a pet’s ability to empathize. My rather large English Bull Terrier was famous for cuddling up (preferably on your lap) when a family member was upset. But what we need to understand is that their response to our well being goes beyond transitory sympathy. The actual depth to which they take on our issues is truly astonishing, potentially leading to their failing health, and must be addressed if we are to give our pets the best opportunity for health and vitality. Catherine J. M. Diodati, B.A., M.A., R.M.P. 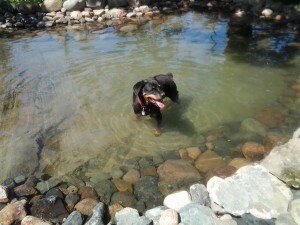 “In 2012 my eight year old Rottweiler, Rosie, got Lyme disease; I had had a vet remove the infecting tick and they had sent it away for testing. 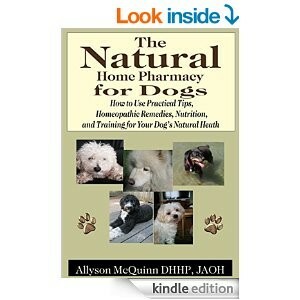 I didn’t want to just put my dog on drugs to manage the symptoms which they said would involve Rosie’s kidneys. Also that year Rosie had to have porcupine quills removed at the vet and the anesthetic which should have worn off in a few hours kept her stupefied, laying on the kitchen floor for twelve hours. Rosie in her inability to move let loose a full bladder and just lay in it since I couldn’t move her and her ninety pounds. I didn’t know what else to do for her until I met Allyson last winter 2014 and happened to mention that my dog had become incontinent. Before Allyson started treating Rosie, I had noticed that my dog had started peeing more often and throughout the winter I could see pink drops in her urine. Later she would try to pee outside and squat a dozen times trying to relieve her bladder. She was also wetting her dog bed everynight. My dog also had lost her zeal for walks and I had to coax her along on a leash even for a walk of less than a kilometre. Allyson told me that Rosie’s peeing would probably get worse before it got better. One day on a six km walk this summer, Rosie’s energy level having returned for exercise, she let out a pee that was mostly blood. Even though it was alarming to see what looked like an ounce or two of blood and pee coming from her, Rosie seemed happy and healthy; she didn’t look in pain or wince as if it had bothered her. She just kept on with the walk as if nothing had happened. After that I didn’t have to clean up another piddle in the house or wash her bedding every night anymore. It’s been over a month now and friends who haven’t seen Rosie since the winter have commented that she looks and acts like a new dog Not bad for a ten year old. Just when you thought that it couldn’t get any worse than the Syphilis miasm, along comes Lyme Disease. The classic microbial form of Lyme is transmitted by the deer tick, and has been increasing in incidence in recent years. It is a parasite which wreaks havoc with the immune system, and is behind many “mystery” illnesses which have been very difficult for the medical system to logically and consistently identify and diagnose. In many ways, the Lyme miasm is a continuation and transformation of the themes of Syphilis, and even the shape-shifting quality of Syphilis is seen in the Lyme spirochete, whose surface antibodies can shift and adapt when attacked by the immune system. Through all systems in the body, the Lyme miasm even beats Syphilis at its own game of shape shifting, and being nearly impossible to pin down. In many ways, it is as if Syphilis has been turned inside out to produce Lyme. Where Syphilis is very outwardly directed in terms of blame and hatred of the world, Lyme is a much more introverted disease, and produces the phenomenon of the hermit who is cut off from society, and strives to become as much of an island as possible, despite John Donne’s famous quote. Conditions such as agoraphobia are very much fuelled by this miasm. Syphilis produces any number of self-destructive processes, including auto-immune disorders. This tendency is also there in Lyme, but in a way where the appearance of the disease is very difficult to pinpoint, and its manifestations may shift frequently, and become difficult to diagnose and treat. There are many symptoms at the mental level, including difficulty in concentration and great loss of memory. Emotionally, the Lyme patient will tend to be highly irritable, with an attitude or behaviour which pushes other people as far away from themselves as possible. The physical symptoms can vary far and wide through every system of the body, and can include skin symptoms (including the characteristic “bulls eye” rash), joint pains leading to arthritis, migraines, or facial palsy symptoms. The true art and science of Heilkunst medicine knows no bounds and when Lyme Treatment came up on our radar for suffering patients this August. We were ready. The interesting thing is that you no longer have to be wading through fields bare legged and attract this formerly tic-borne disease to incur the awful effects of the Borrelia burgdorferi bacteria. Our citified patients were showing up in droves this summer with this insidious infection looking for Lyme Treatment that includes symptoms like fever, headache, fatigue, depression, and a characteristic skin rash called erythema migrans. Left untreated, late manifestations including stiffness the joints, heart palpitations, and nervous system dysfunction can occur. The sleep can become disturbed and the nausea in the morning can leave the sufferer wondering if they’re pregnant. Check out this Wikipedia link for even more info should you like. Lyme is pervading our culture, unfortunately, just as diseases like Syphilis, Tuberculosis and Malaria were once infectious in origin, they now pervade our terrain endogenously spawning symptoms most don’t even know are anchored to these un-cured Genetic Miasms* … that is until now. Lyme Treatment is also becoming critical in the treatment of Autism, A.D.D. and A.D.H.D. and most of these kids haven’t been hiking in the hinterland. An even bigger problem is the way Lyme Treatment is treated allopathically by conventional medicine. The M.D.’s only defense is to prescribe anti-biotics (literally “against-life”) in the short-term and if that doesn’t work well, (s)he may just prescribe them for the long-term. The amazing thing about Allopathic medicine is that if it doesn’t work, they’ll just give more of it. The problem is, your immunity also gets driven off the cliff with the protocol and the original Lyme disease may be bullied or suppressed, but it ain’t been cured! Alternatives aren’t a whole lot better. If you read Dr. Hulda Clarke’s diet for Lyme disease on her website curezone.com, you may as well also take up car mechanics as a pasttime as well. Good Luck wading through the pages of links and instructions. Go ahead and take a look, I dare you! The part I’m especially intrigued about is at the bottom of the page where she suggests looking at Bert Hellinger’s work on Family Constellations for the spiritual resolution of Lyme ??? Wouldn’t I be a whole lot better off spiritually if I didn’t have to deal with the pain and suffering of the disease in the 1st place? Through Heilkunst, you get Lyme Treatment based on principles of cure. You can then leave your car to the Mechanic! At Arcanum Wholistic Clinic, Lyme Treatment is done on the basis of the law of similars, you just give the nosode (see http://www.thewholedog.org/id63.html) and voila … le cure! NO muss, no fuss. The reason that you need a Heilkunst Practitioner to do this is because we are trained full-time for four years in the principles of Heilkunst, including dose and potency, sequential prescribing and what to do if secondary or pathic diseases spontaneously offshoot from the primary disease. All that to say … don’t try Lyme Treatment on yourself at home. Lyme is so recently pervading our midst over the last 3 years sans les tic that Jeff Korentayer, HD here at Arcanum just figured out what the pathic ** for Lyme is this past weekend … and you won’t find that bit of juicy stuff anywhere else in the world. So if you are plagued by sleepless nights, headaches, fever, nausea and bone pain (especially in the lower legs/shins), please give us a call for principled Lyme Treatment. There is no need to suffer the symptoms … or even the cure. *A Chronic Miasm is passed on though the genetic code creating chronic disease symptoms. These anchors indicate our romp through evolution and used to be infectious in nature. Most people are thrilled to find out their OCD stems from Syphilis, or their chronic Bronchitis is anchored to Tuberculosis or their arthritis came from Gonorrhea. Chronic Miasms can only be cured through lawful prescribing on the basis of Like Cures Like. ** A Pathic Disease is a secondary disease sort of like an adolescent disease anchored to the mother disease. Often when we go after the mother, the any baby diseases just get addressed with her, however, in some instances, the baby has grown into and adolescent and becomes it’s own entity to be dealt with separately. In this case, the genetic miasm, Lyme was destroyed in a number of patients, but the residue of a secondary disease remained. Plumbum and Floric Acid have proven very helpful in these cases. Thank goodness for constantly researching Heilkunstlers and their awesome patients.